Damn. I've had brunch at the North End Diner more times than I can count. It was one of those old-style greasy-spoon diners that there are less and less of these days...perhaps because they keep catching on fire. I remember about 15 years ago when the restaurant at the other end of that block, The Acropolis, caught on fire and burned to the ground. There's still an empty gravel lot there now. I hope the same isn't true 15 years from now about the whole block. At least we've still got the Ardmore Tea Room and the Armview. 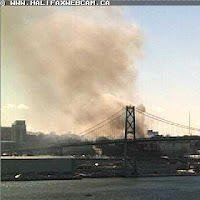 You can still see the smoke on this webcam as of my writing this.